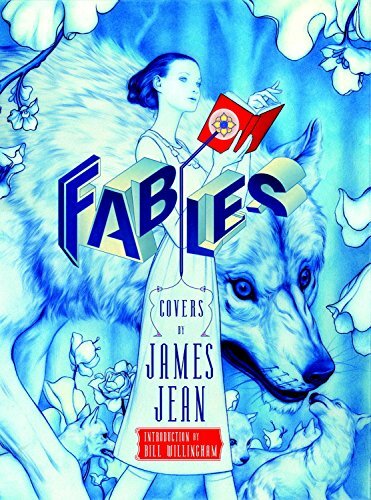 So here's the 2015 new edition of Fables Covers: The Art of James Jean that was originally published in 2008. The first edition had cover art for the 75 single issues up to the point of Fables: War and Pieces which was released in 2008. In this new edition, the new cover artworks includes the The Dark Age (6 covers), Fables: 1001 Nights of Snowfall (1 cover), Jack of Fables (11 covers). Other than that, you also have a new cover art for the book itself which is actually two separate pieces of paintings. Bill WIllingham's interview with James Jean is still at the back, as well as the several photos of James Jean's studio. And the book's still a hardcover. In short, this new edition gives you 50 more pages of artworks. So you get 256 pages in total. Some places have the total number of pages listed wrongly. The artworks from James Jean are absolutely beautiful. There's this fine art quality from him that I really love, as compared to other comic covers that feature very stylized comic characters. Going through the covers, you'll notice that James Jean works with a variety of media to create the covers. There are the rough sketches and finalised cover art. While some have the Fables title built into the art, others are clean without the titles, barcodes or any words. Winning six consecutive Eisner Awards from 2004 to 2009 is a testimony to just how good he is. Interestingly, this book is also available in Kindle format for almost the same price. Is it worth the money to get this new edition? Well, if you don't have the earlier book then it's a must-buy. If you have the earlier book, then it feels like spending money yet again to buy the additional pages. I always have this love-hate thing with new expanded edition books. As a standalone artbook, it's highly recommended. One of 2015's best artbooks that's for sure.